Heat Pumps, Smart Controls, VRFs, Oh my! NEEP invites you to explore how the region can work collaboratively to accelerate the adoption of air source heat pumps (ASHP) and variable refrigerant flow (VRF) systems. These renewable heating and cooling technologies are increasingly seen as important solutions to a low-carbon future in the Northeast and Mid-Atlantic region and beyond. These technologies, and others, will transform the way we heat and cool our homes and businesses. This event will convene a diverse group of key stakeholders from across the ASHP/VRF markets, including manufacturers, program administrators, installers, technology experts, state/local policy makers, and others to coordinate effective implementation of regional market transformation strategies. 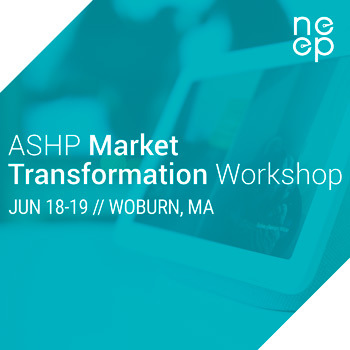 Market transformation strategy reports for ASHP and VRF, developed through NEEP’s ASHP and Smart Controls Initiative, will provide frameworks of key strategies for stakeholders to discuss, explore, and debate. More information about NEEP's Initiative. This year, we will again partner with travel company TripZero (a Certified B Corp) to offset the carbon footprint created by travel to our event. Attendees can book the Crowne Plaza Boston-Woburn for $159, and by booking these hotel rooms, we collectively enable TripZero to offset the carbon footprint created by our travel – at no cost to you. Book your room at the Crowne Plaza now. Through the purchase of certified carbon offsets, TripZero funds reforestation and renewable energy projects that remove pollution from the atmosphere. As these projects offset the impact of our travel, they also create lots of benefits for local communities. Learn more here. From essential coffee breaks to full partner options, you can customize the way you want your organization to be involved in our events. Specifically for this ASHP Market Transformation Workshop, we have several available sponsorship options to gain visibility in front of our attendees. If you would like to sponsor this workshop, or have questions, please contact Lucie Carriou, Events Manager.